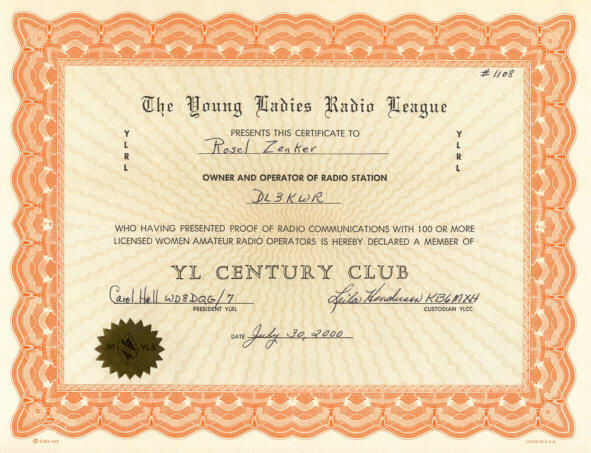 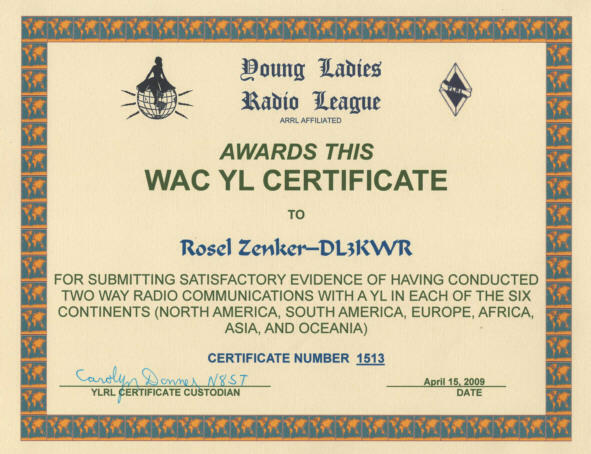 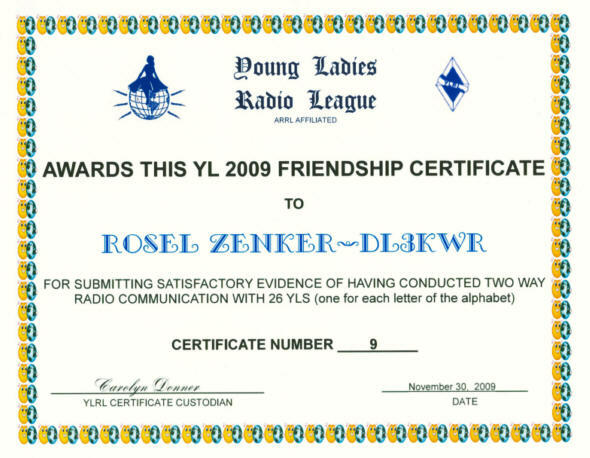 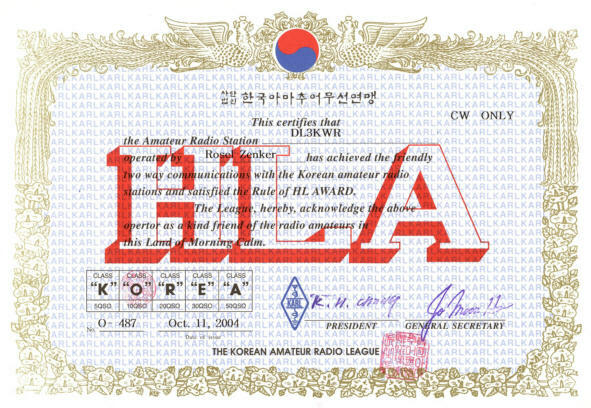 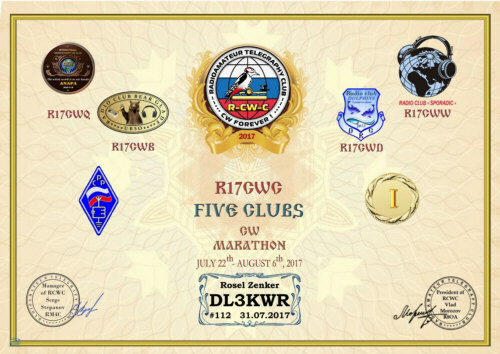 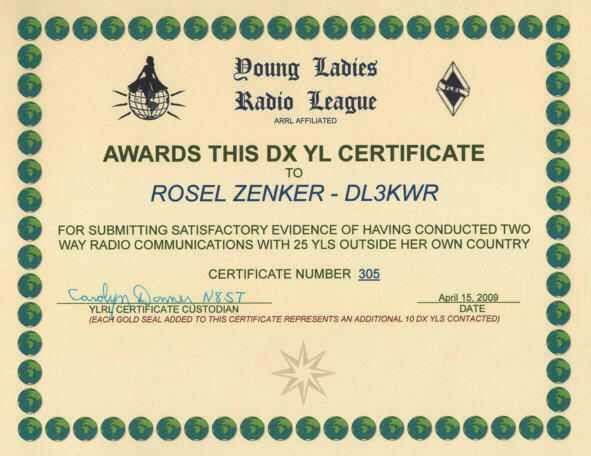 Awards are attractive recognitions for successful operations by amateur radio and as well as motivation and intention for more activities. 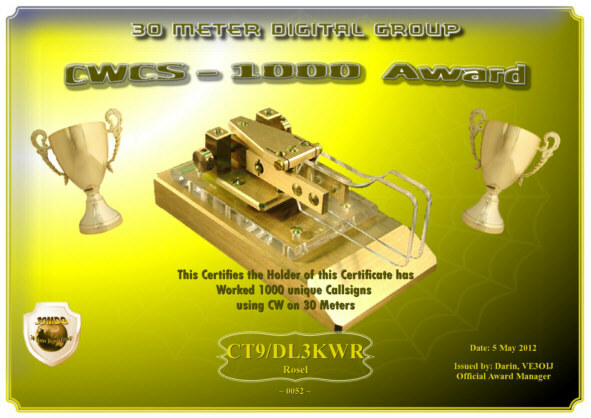 At the same time offer good awards opportunities to preoccupied with interesting questions of the world. 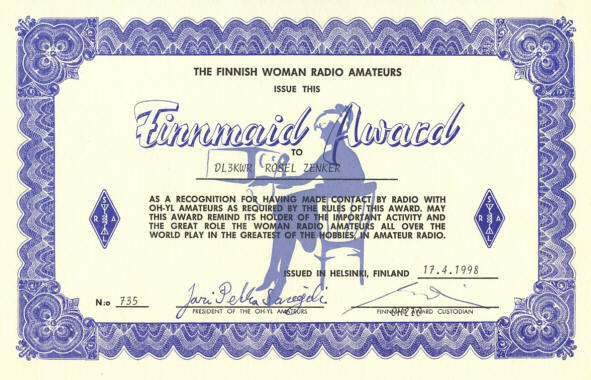 3. to pay and to get the award. 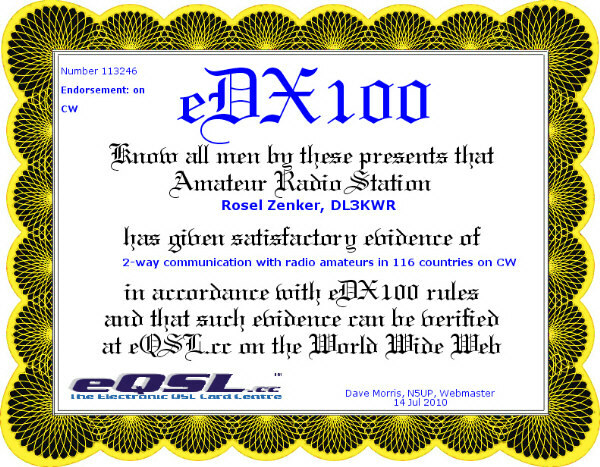 but now there are electronic certificates! 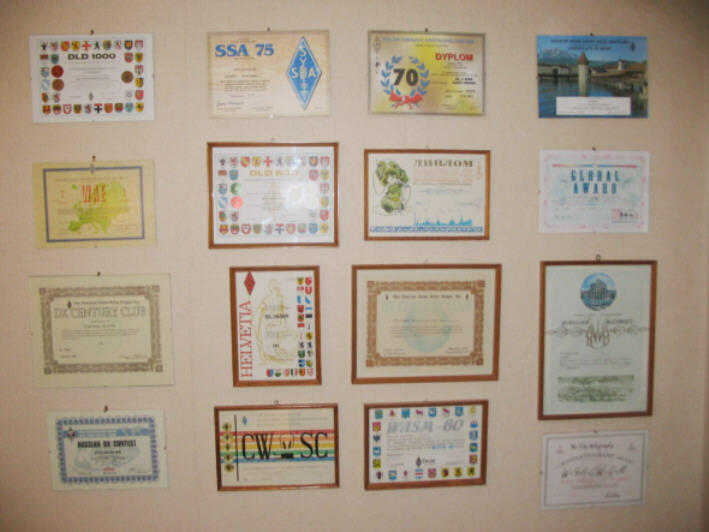 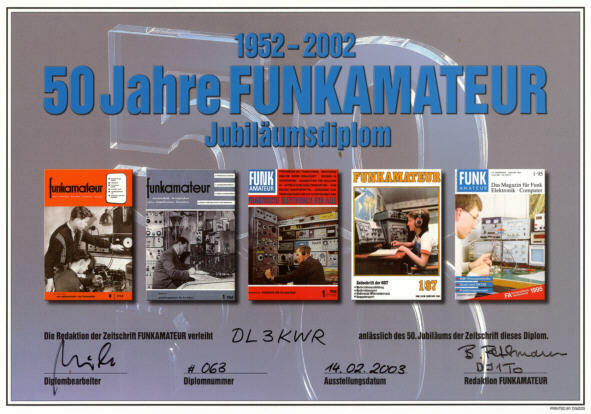 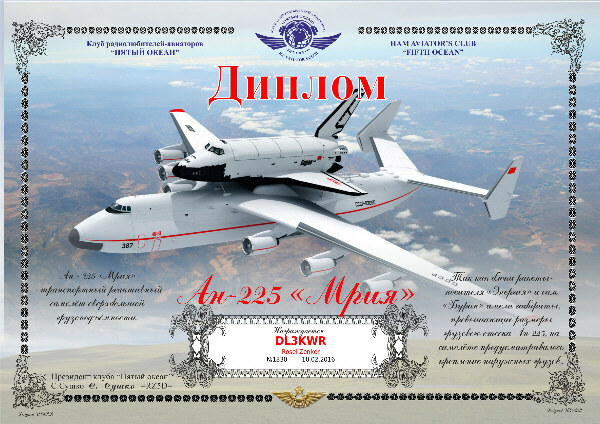 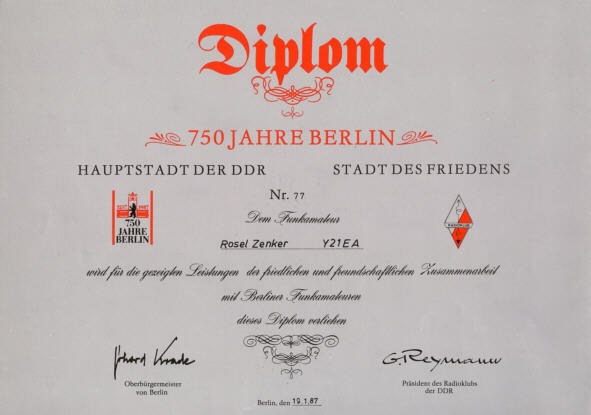 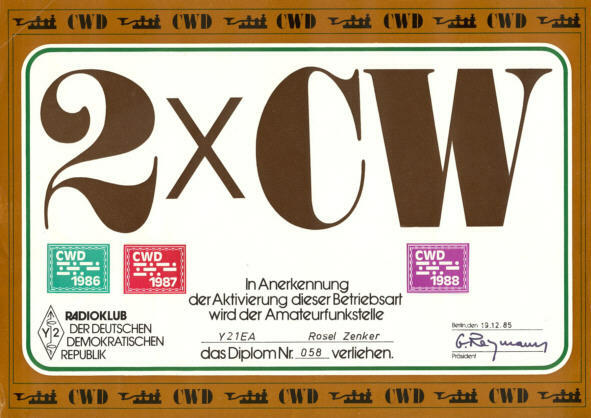 In my collection I have more than 300 awards and certificates. 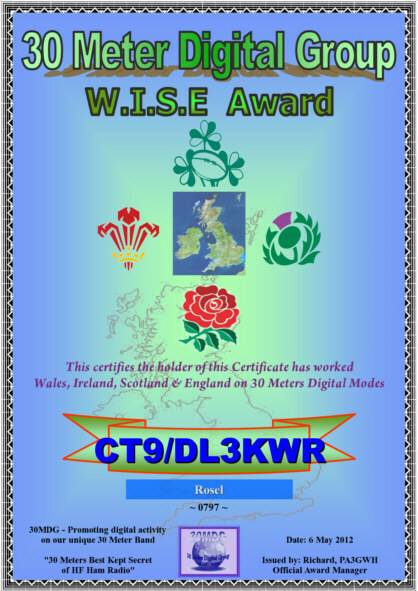 Internet certificates are topical, quick reaching and attractively. 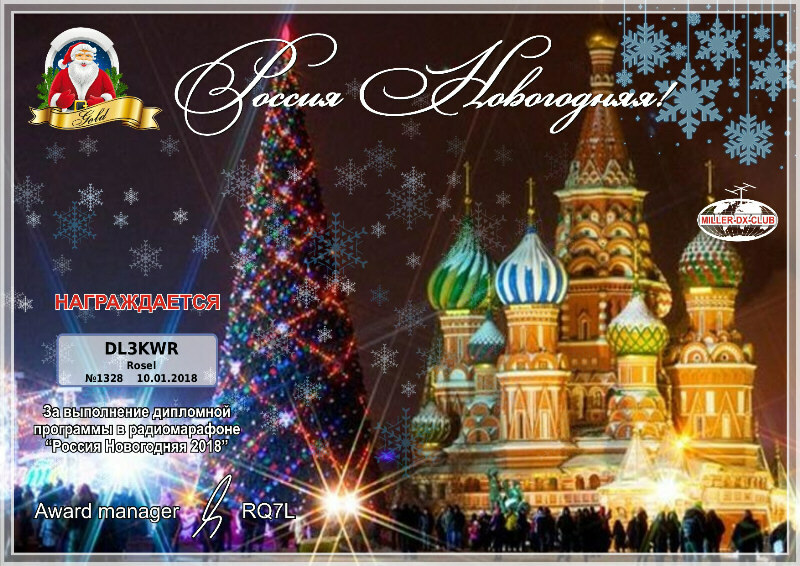 The Megalog contest and event team organises Sochi 2014 radio activities from the 15.09.-15.10.2014 in 3 stages: practic, qualification and the race. 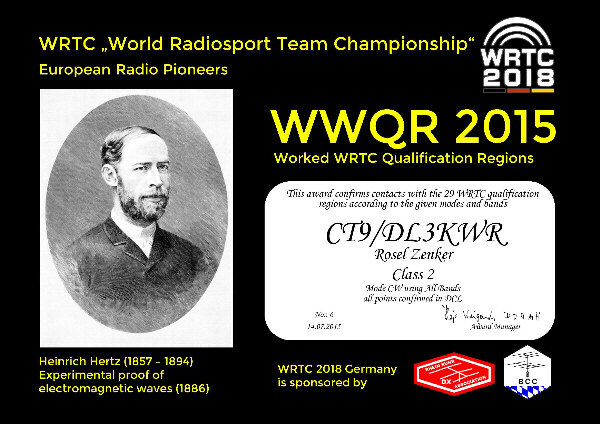 Stations with the prefix UE16 and a suffix, wich stands as an abbreviation for racing teams (i.e. 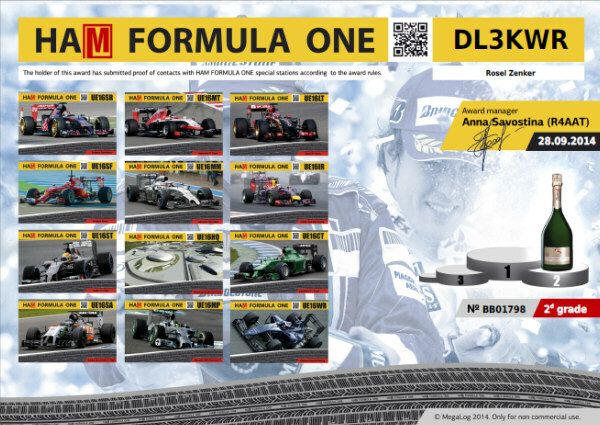 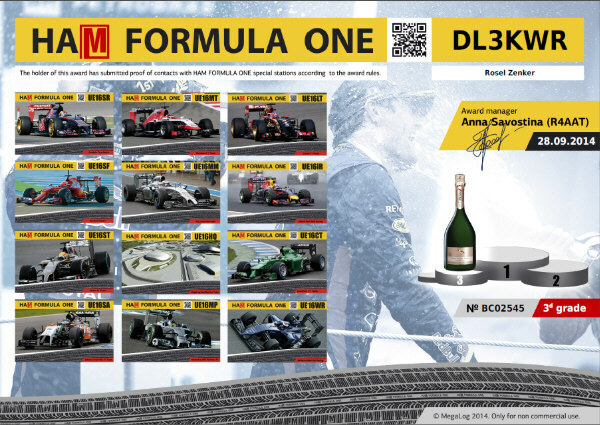 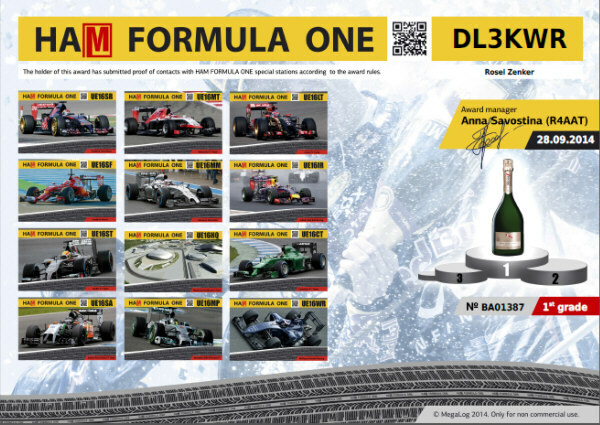 "LT" for Lotus F1 Team) are to be worked. 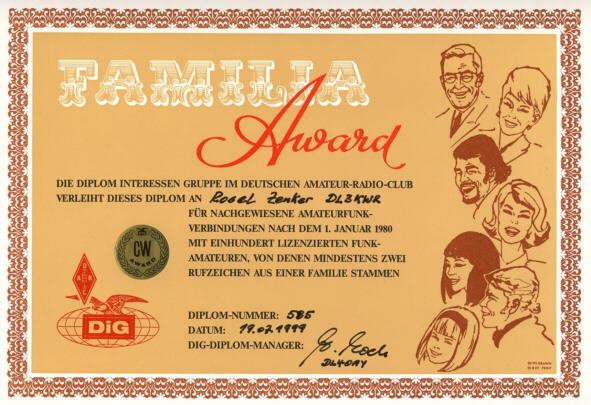 Whole management incl. eQSLs on the Internet. 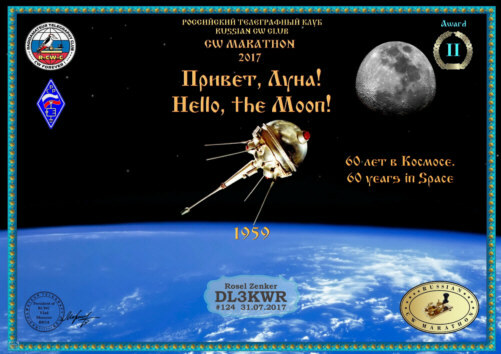 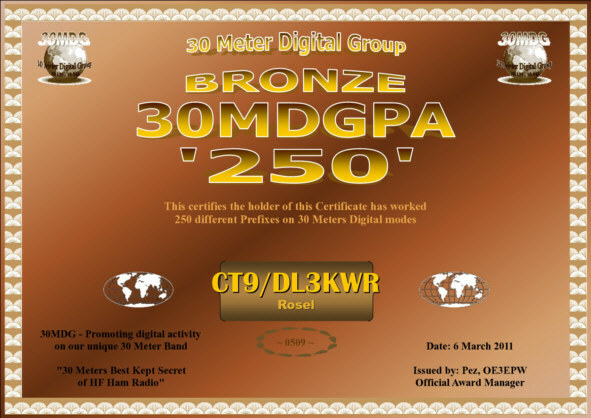 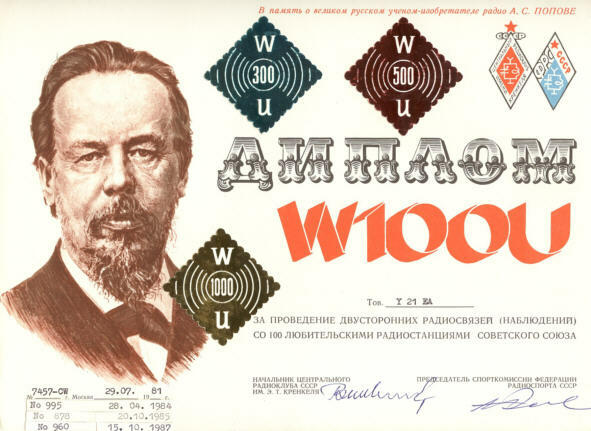 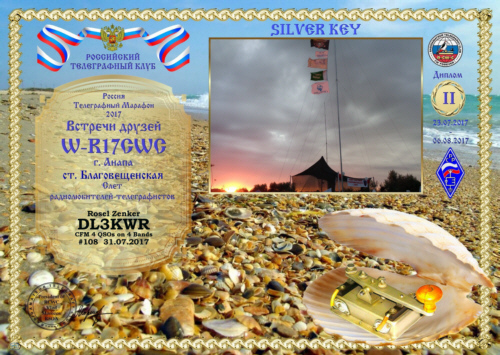 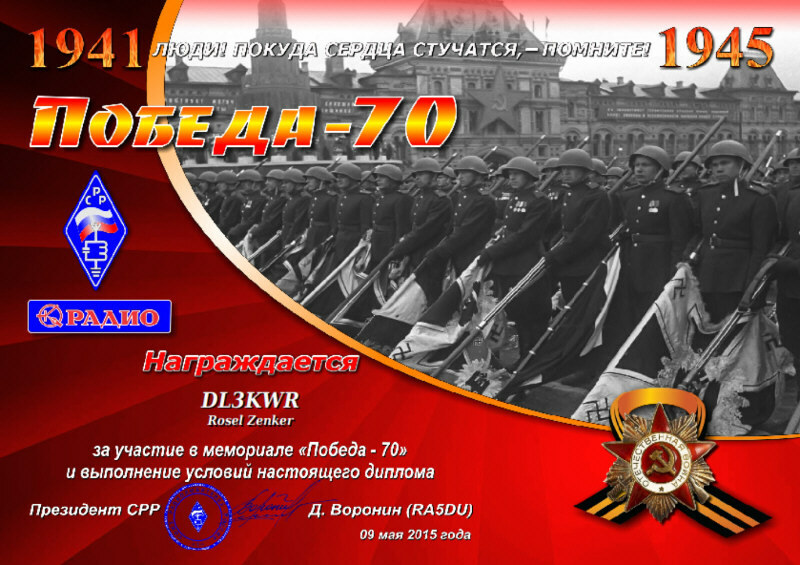 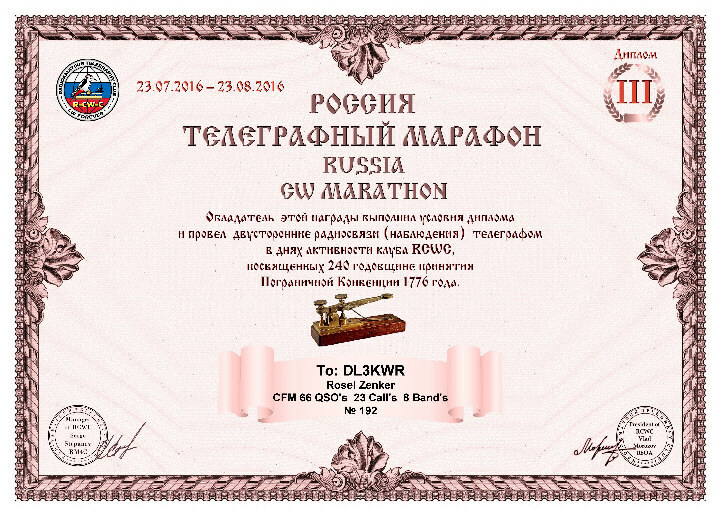 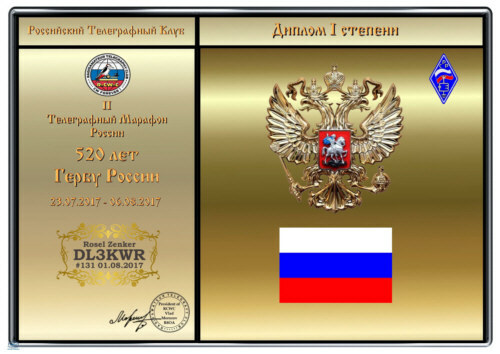 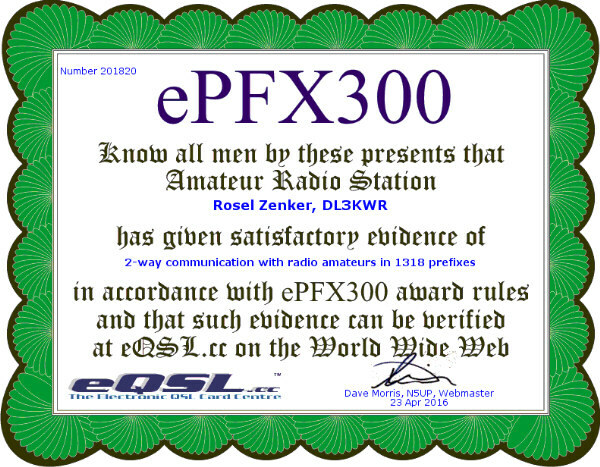 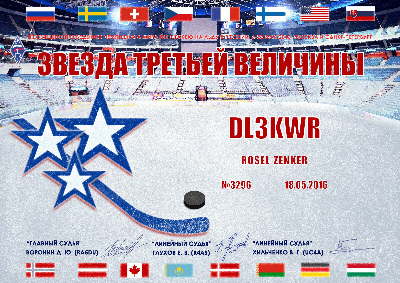 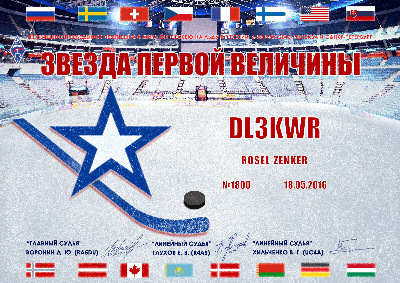 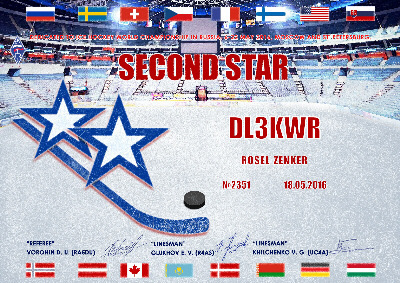 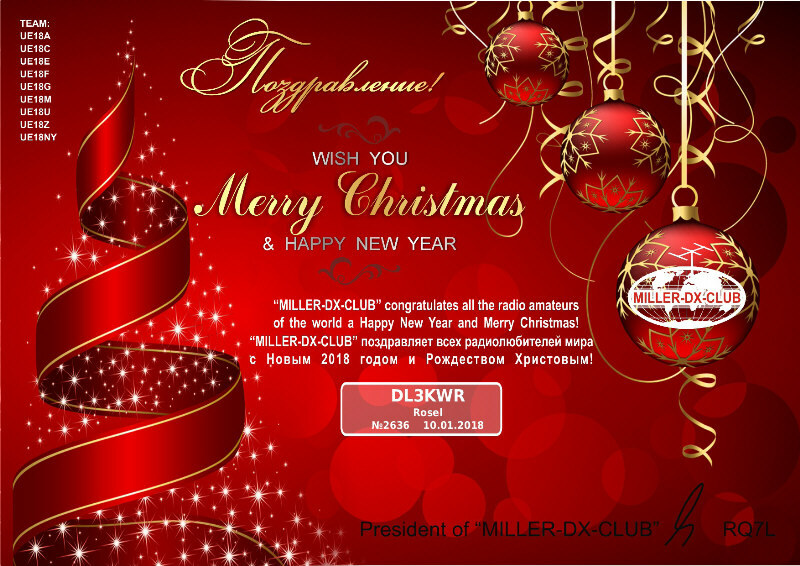 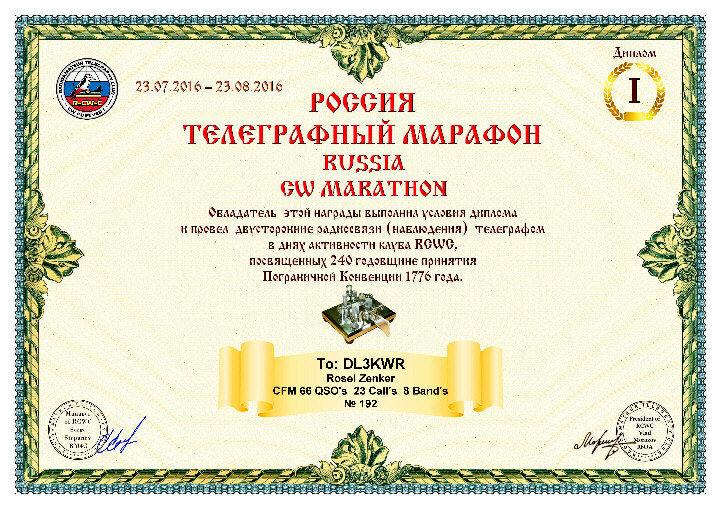 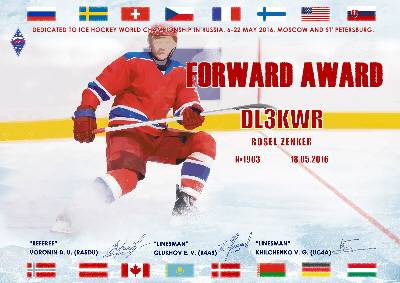 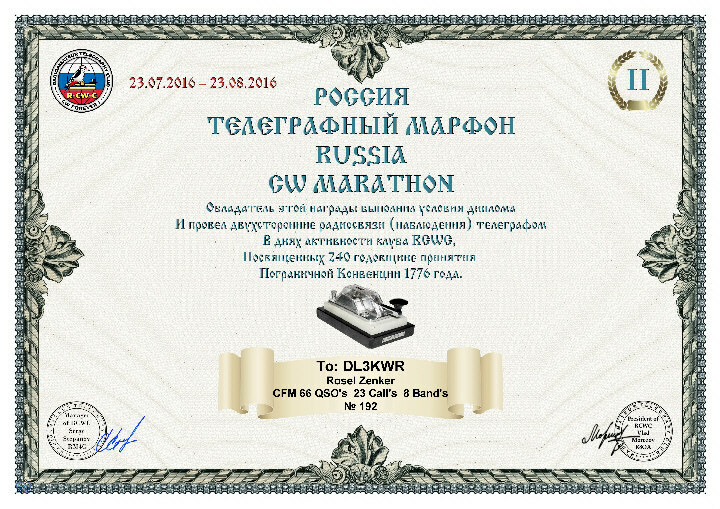 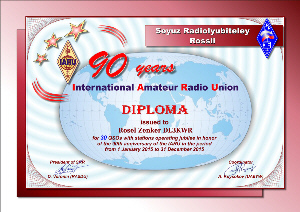 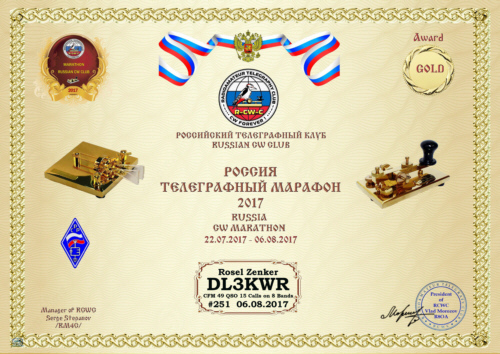 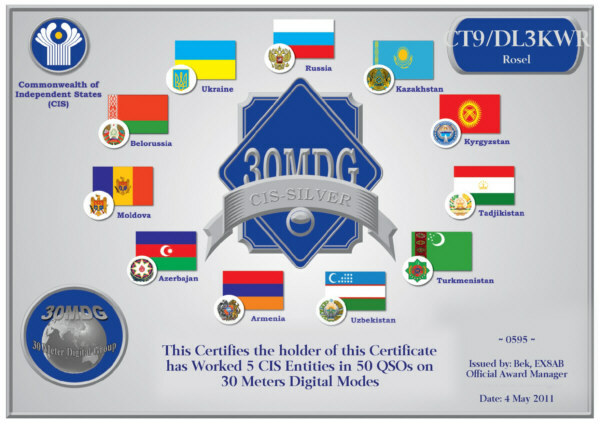 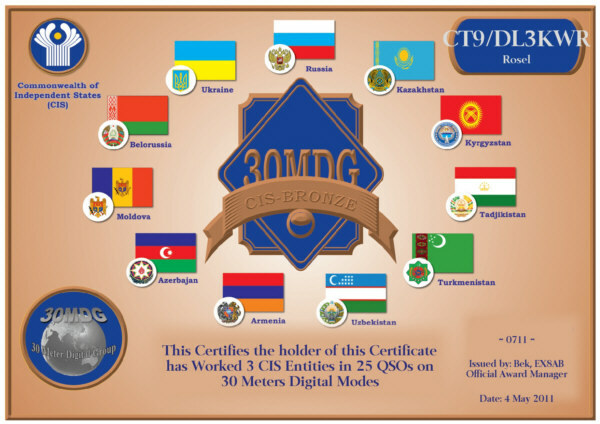 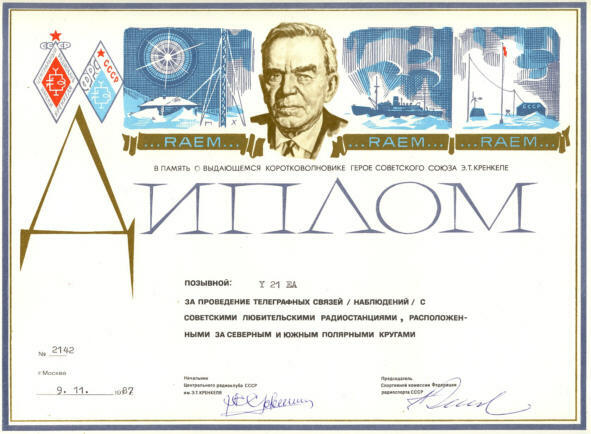 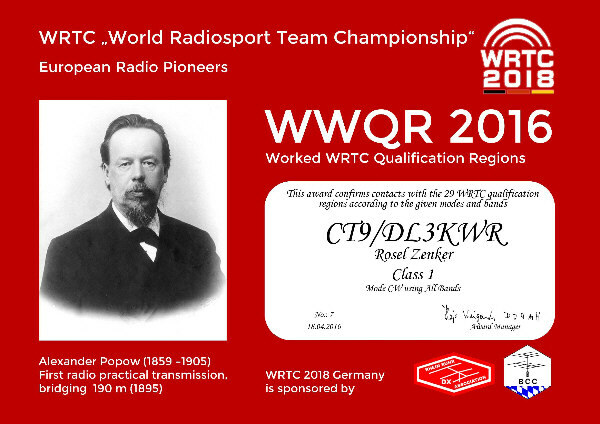 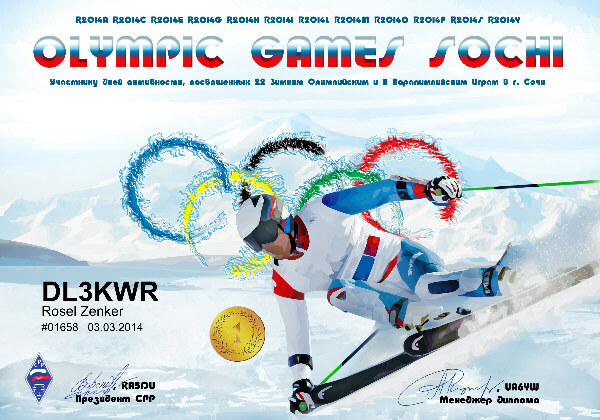 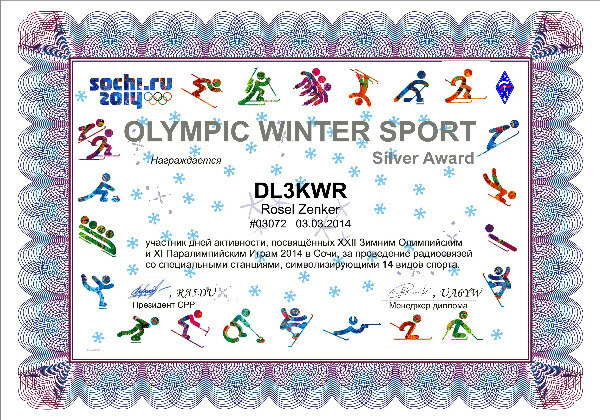 The Russian amateur radio federation SSR has pointed with the radio activities on the occasion of the Winter Olympics in 2014 in Sochi what is a modern amateur radio: 180 special stations, Pile Up up to the last activity day, topical on-line log with fulfilment state in the certificate program, QSL call and ranking lists of the most successful radio amateurs. 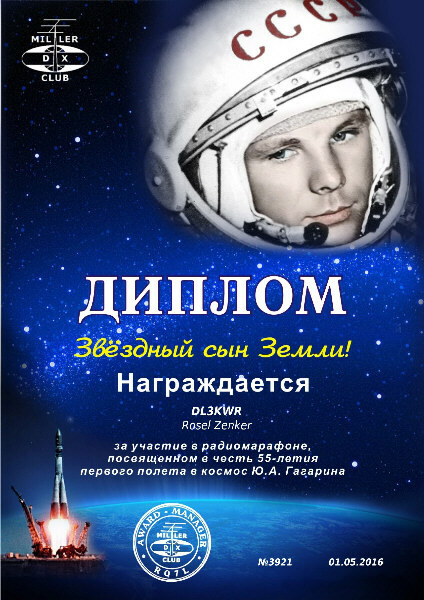 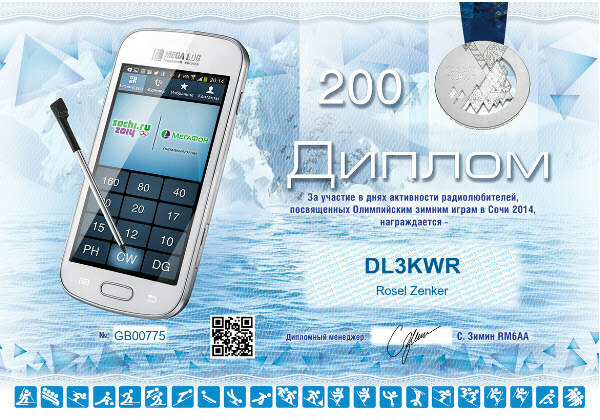 Everybody could see on the web page www.ok2014.ru "his" Olympic results. 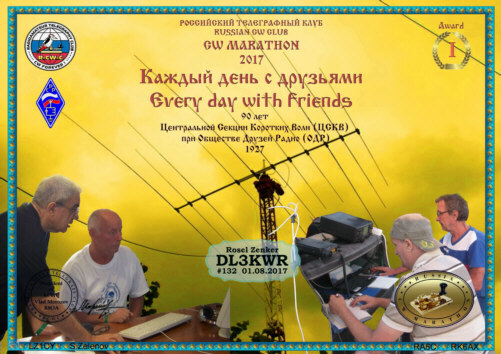 The on-line log contains the confirmed QSOs. 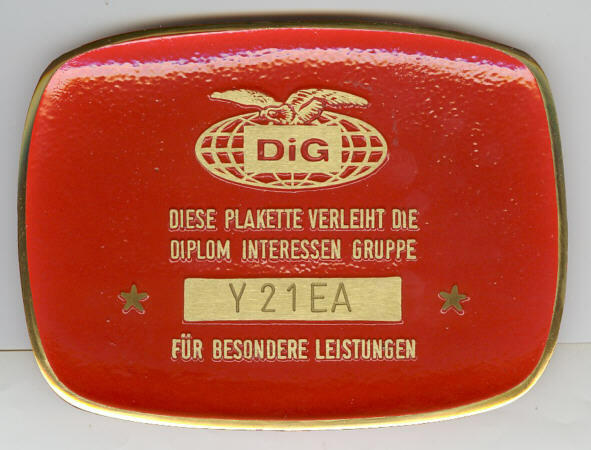 With an farther click the Dipolm is applied. 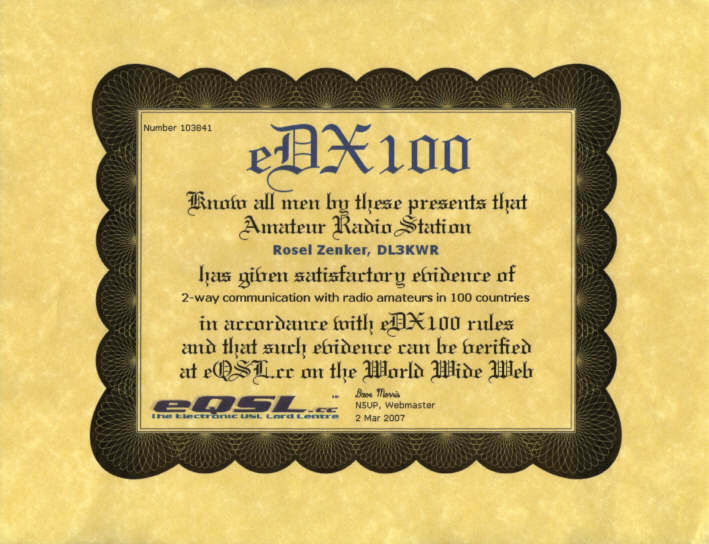 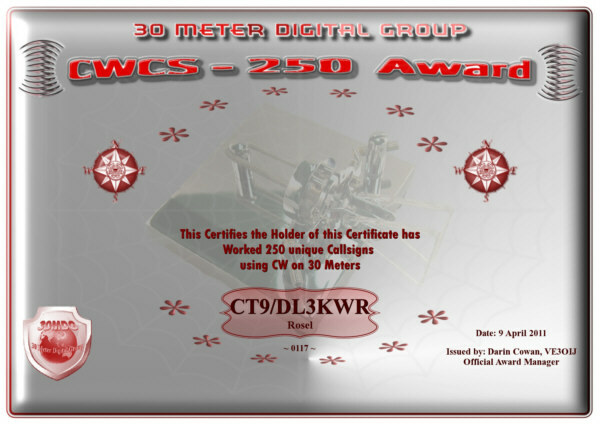 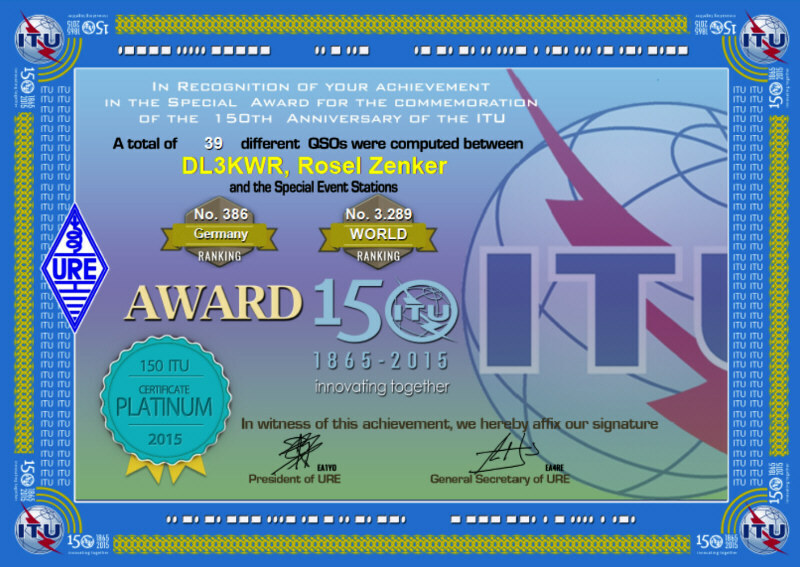 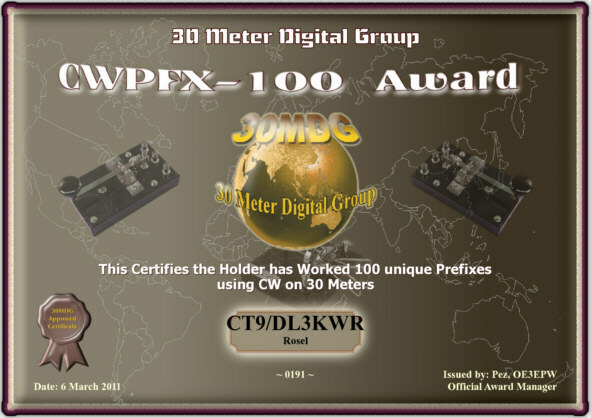 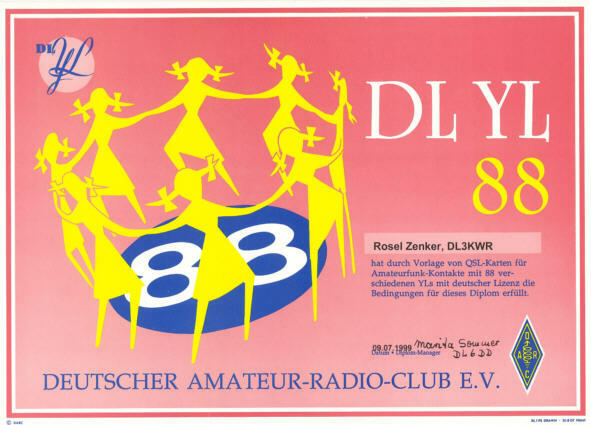 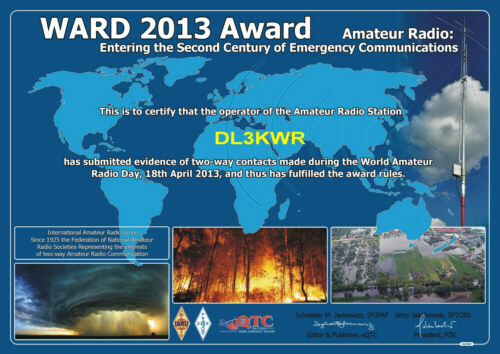 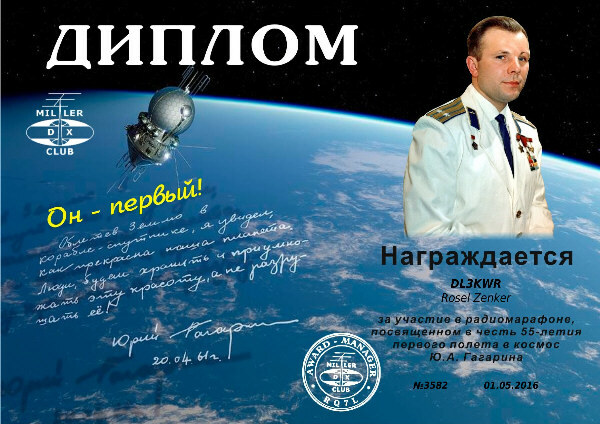 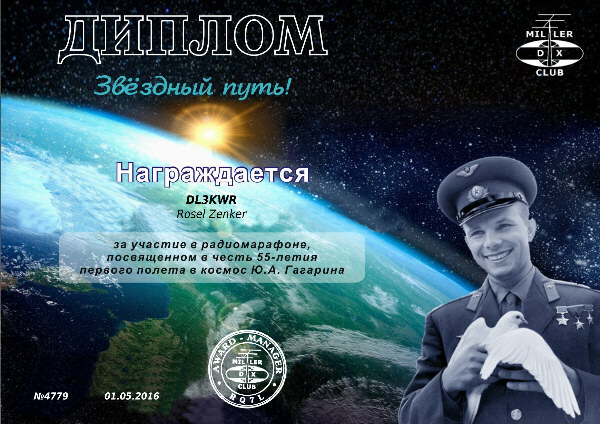 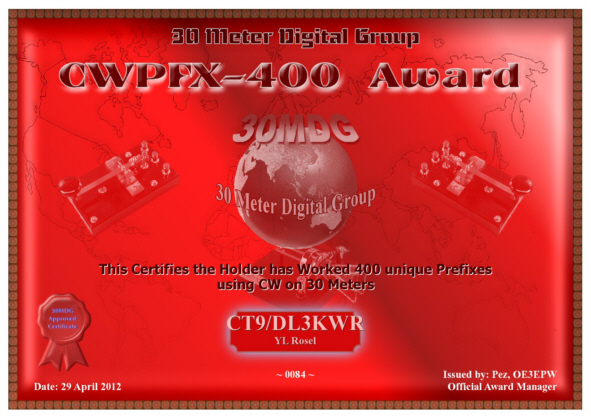 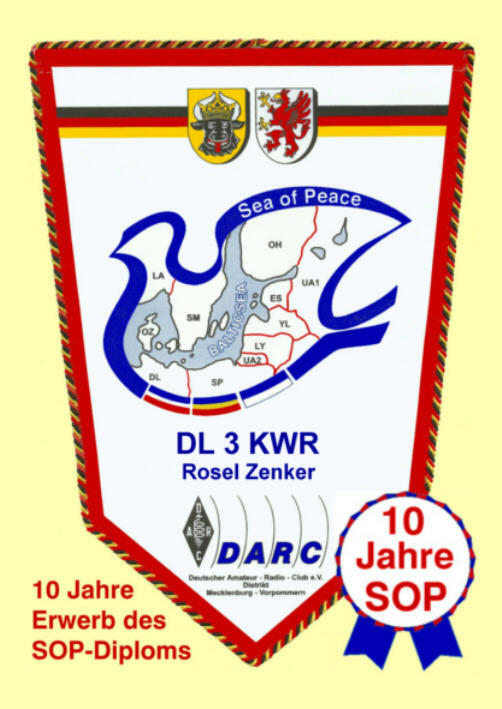 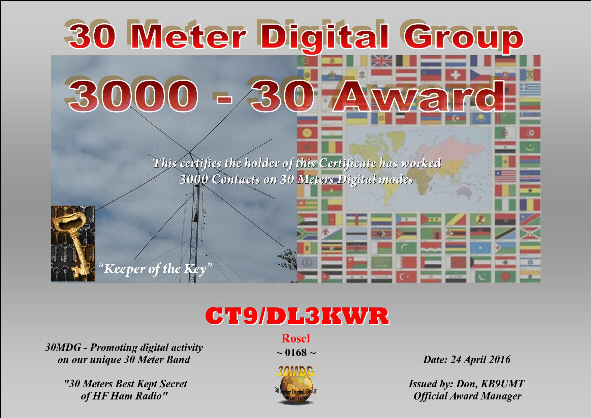 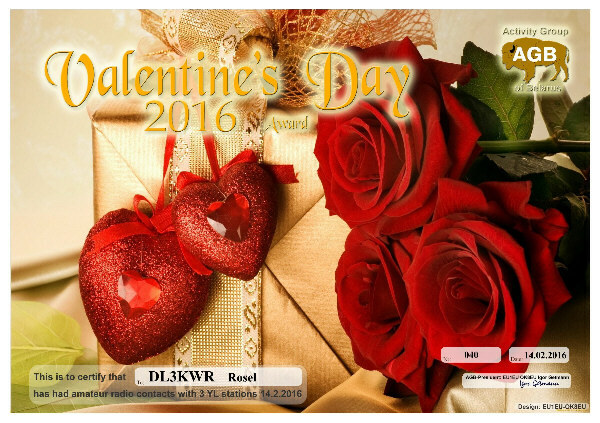 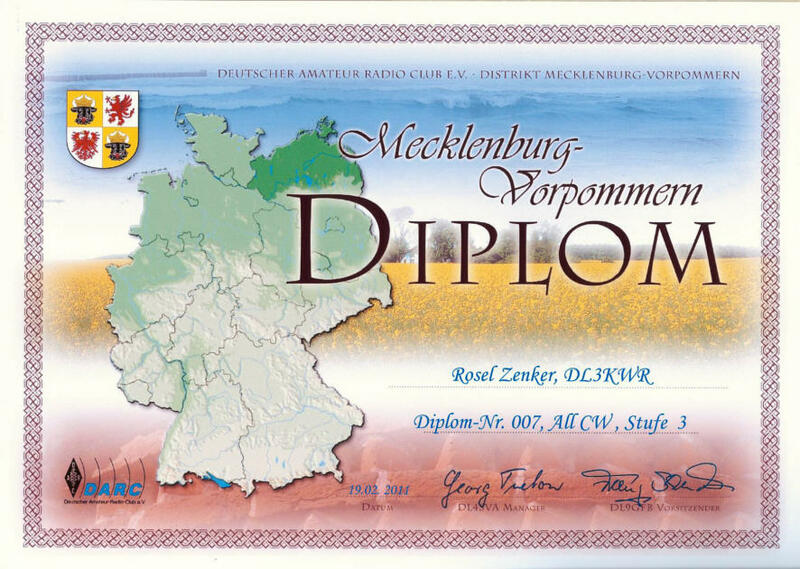 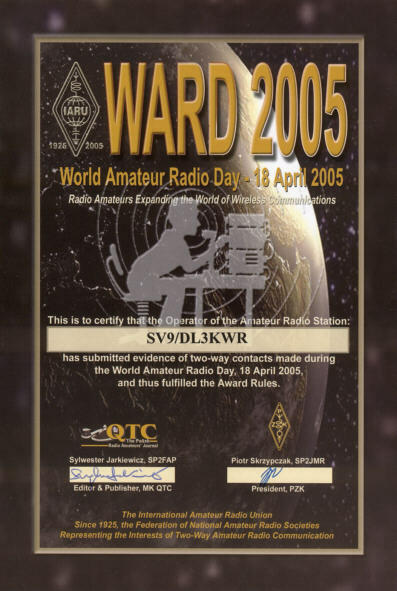 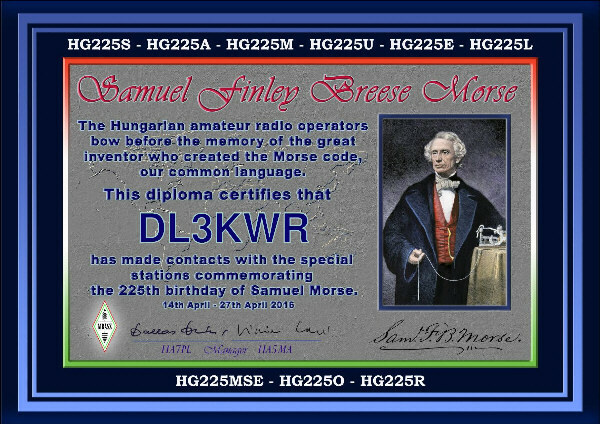 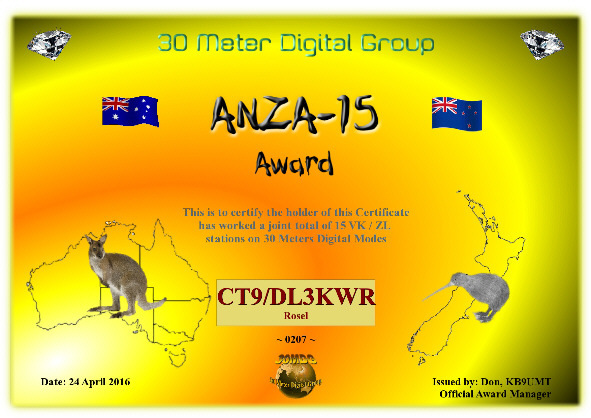 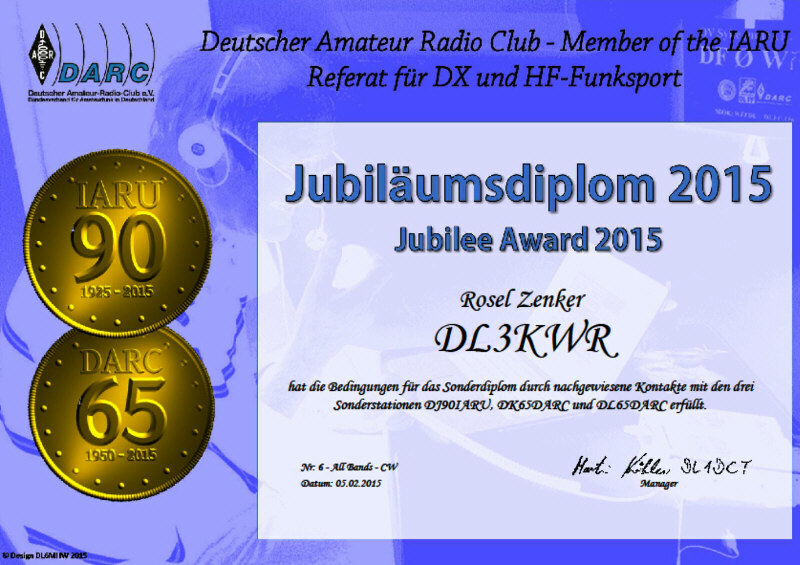 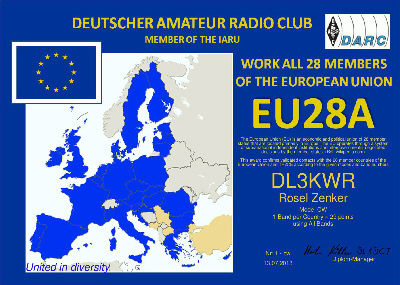 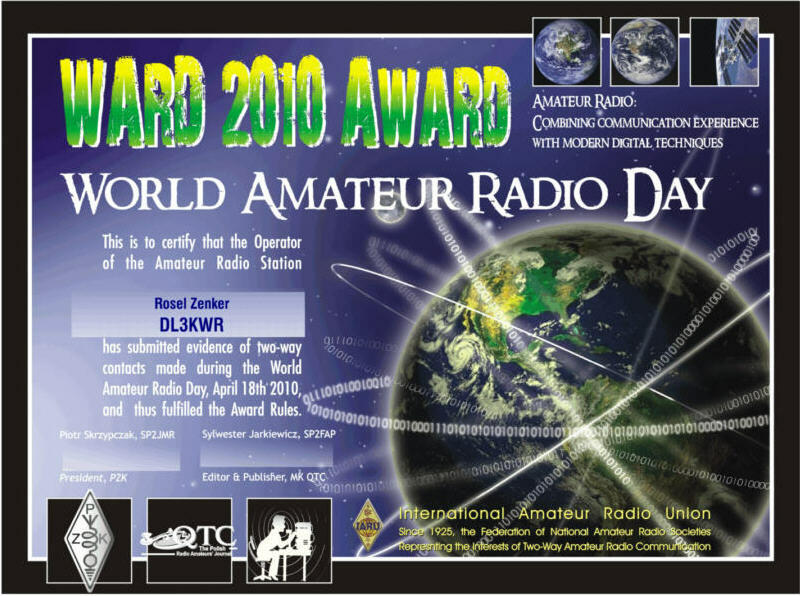 yesterday the QSOs - to day the award ! 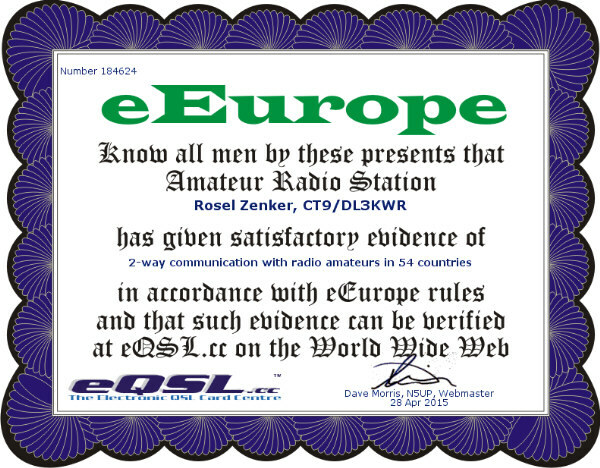 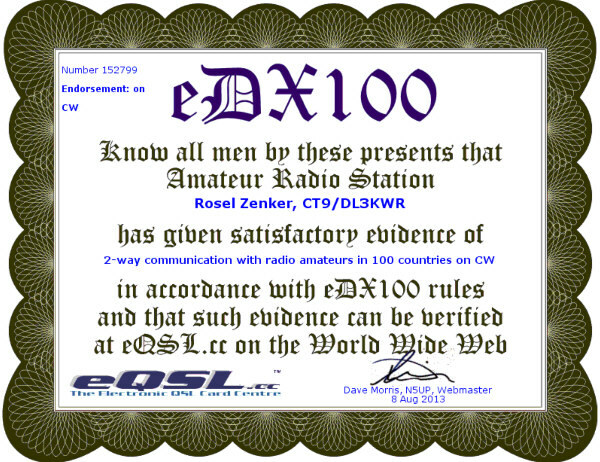 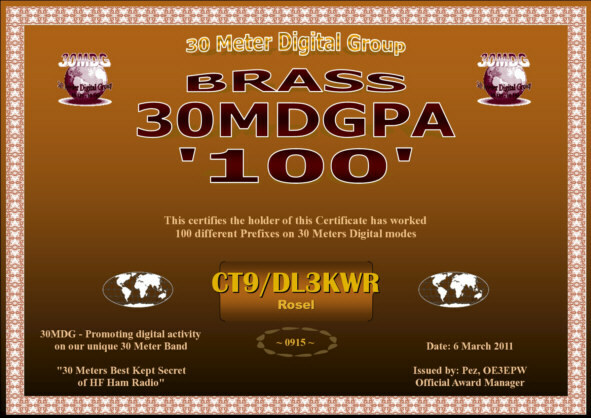 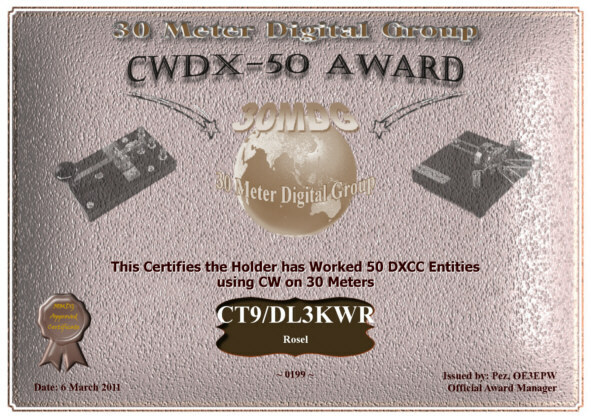 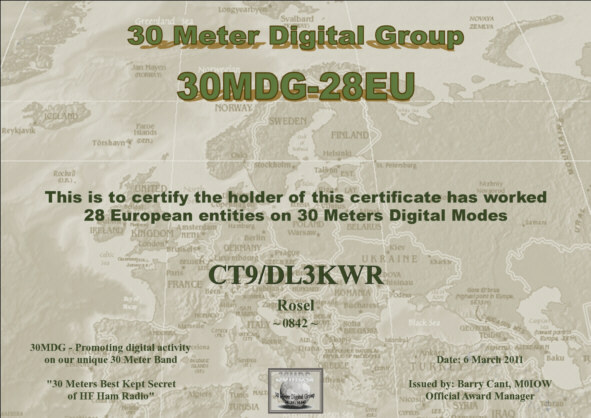 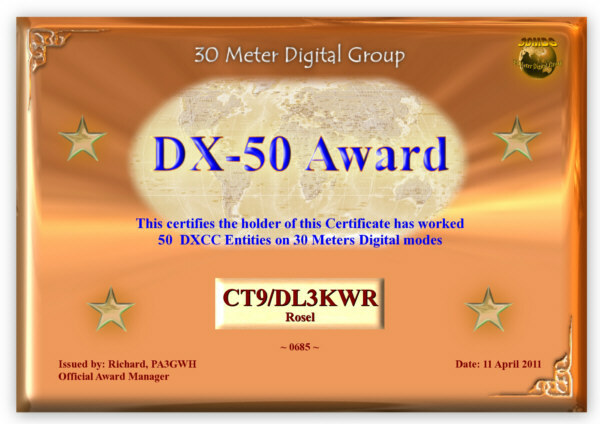 The collection of confirmed QSO data on-line in the DCL allow to search for certificates and on-line apply. 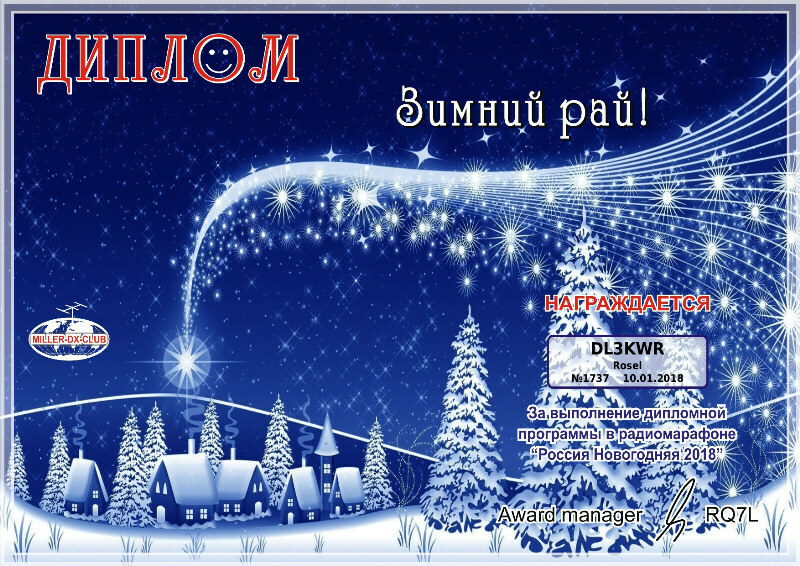 The manager recognises by the contest log fast the fulfilment of the rules. 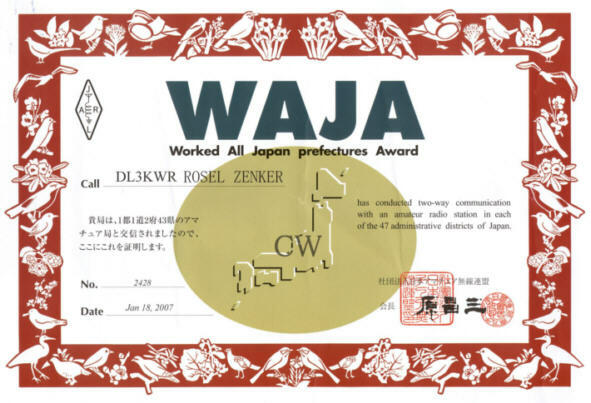 Awards ? 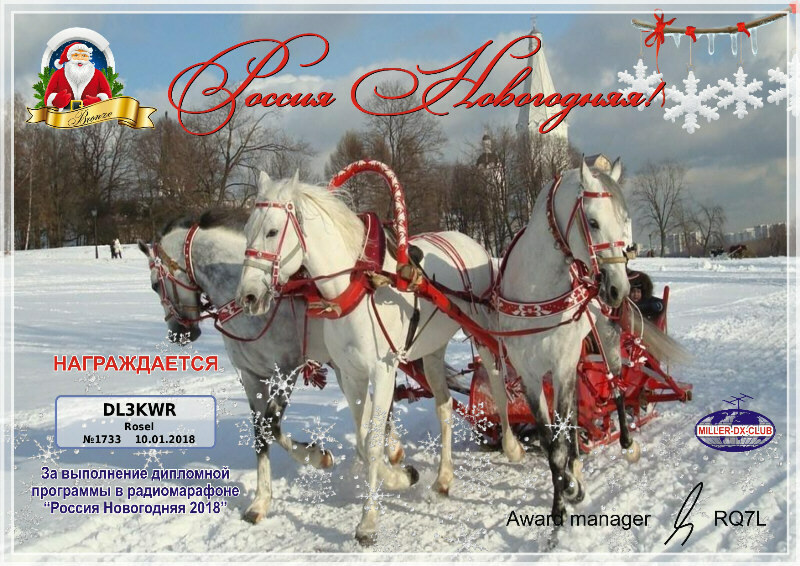 - no problem ! 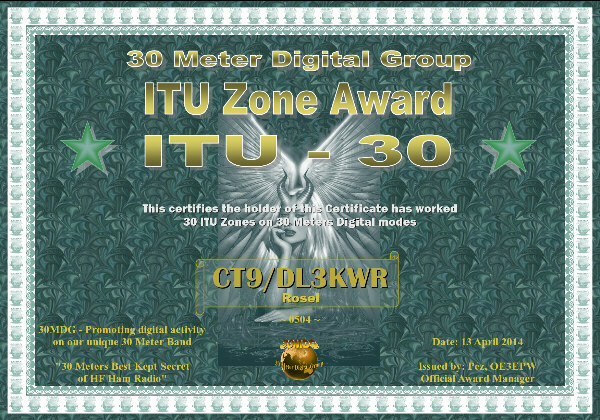 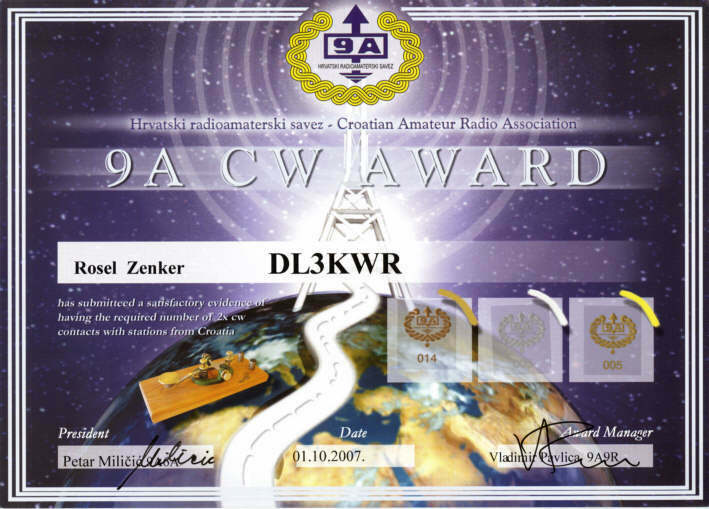 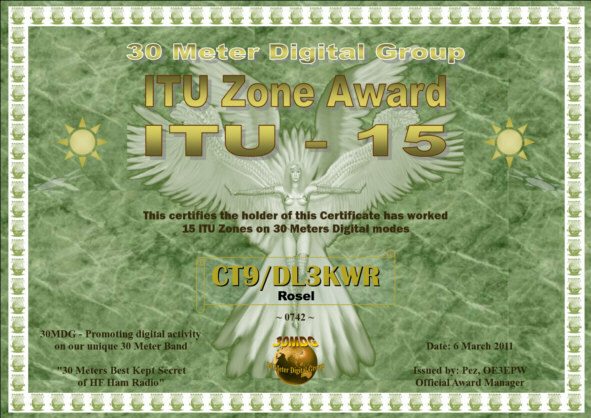 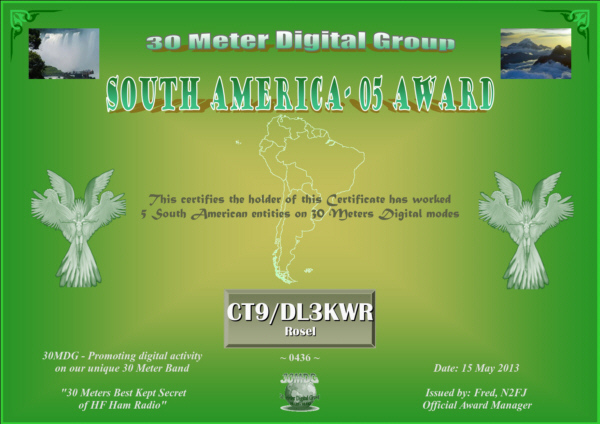 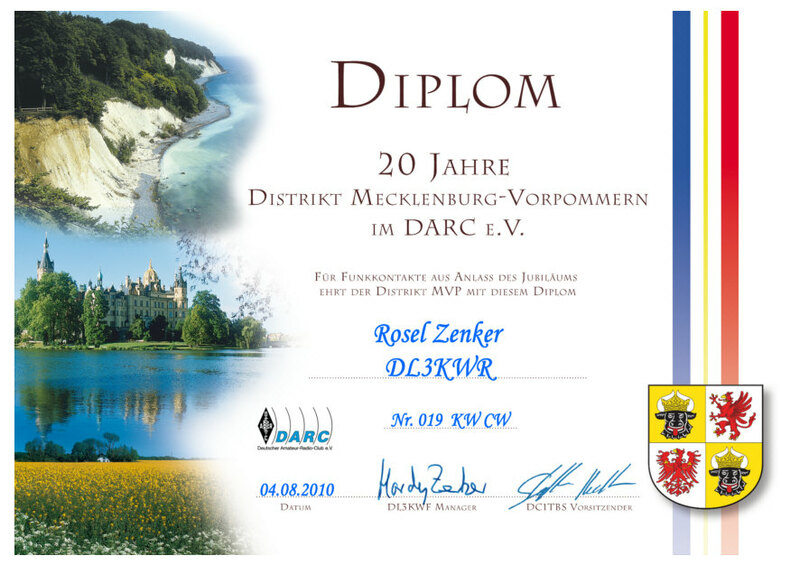 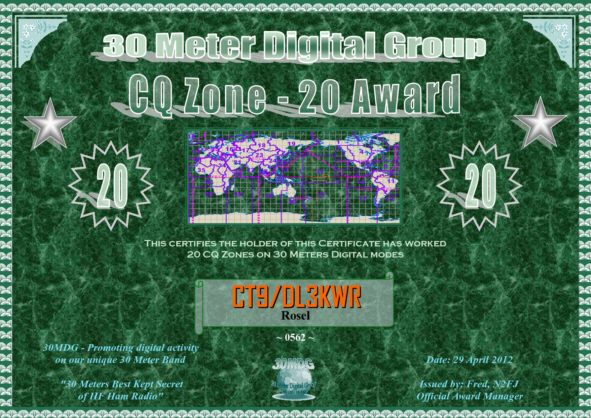 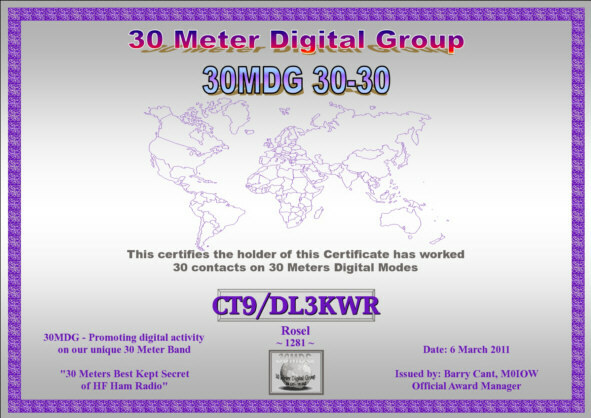 Vacation in 2010: under CT9 / DL3KWR 4314 QSOs, of it 437 on the 30-metre band. 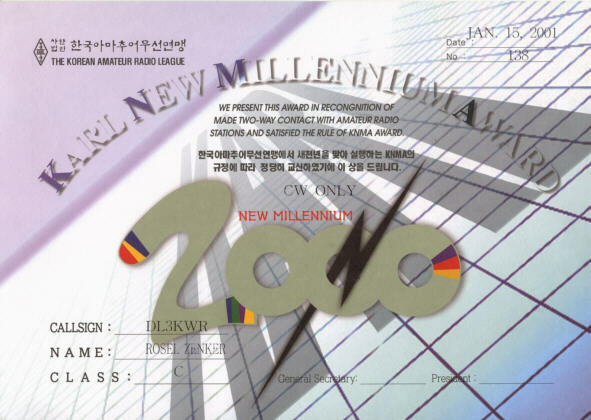 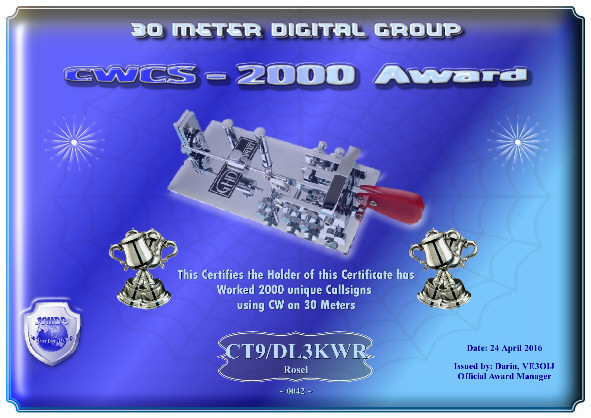 On registering by 30MDG 12 electronic certificates came for the CT9-Call within 2 days. 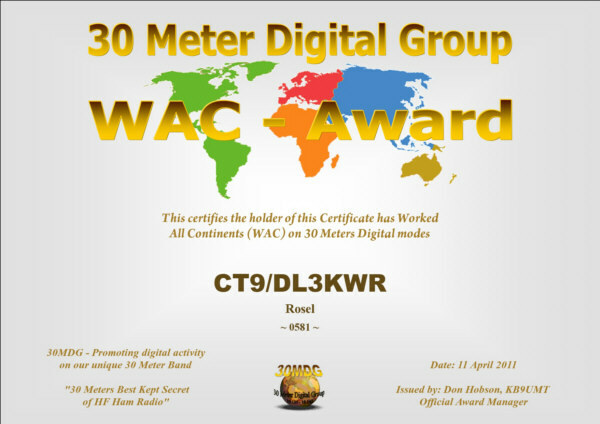 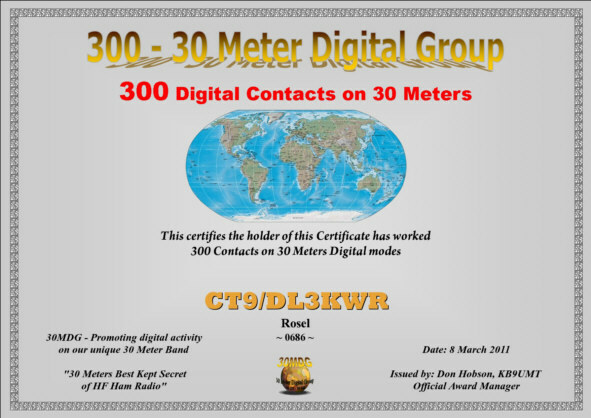 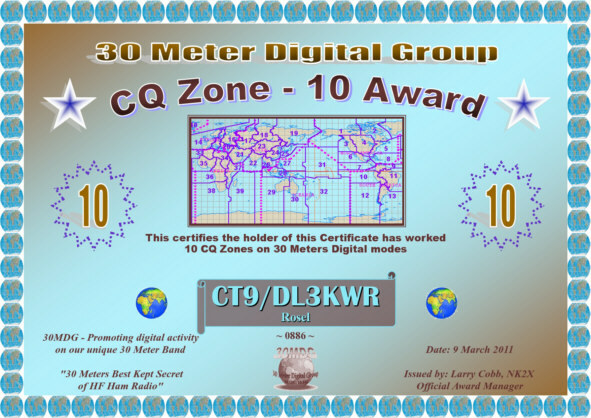 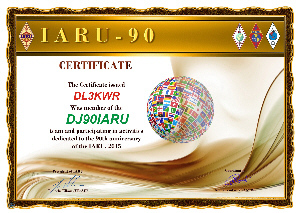 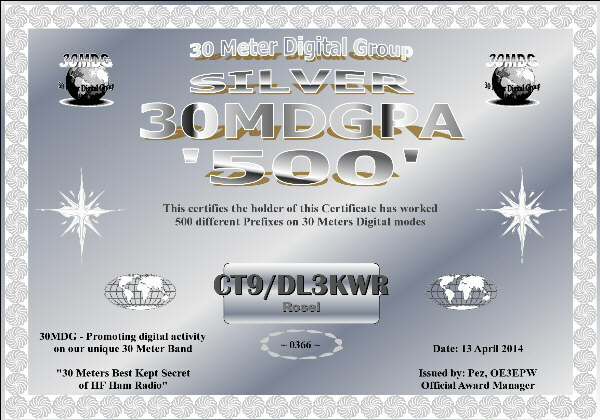 After the CT9 vacation and radio operation in 2011 to 2016 are nearly 3500 QSOs on 30 metres in the log and farther 24 certificates was coming. 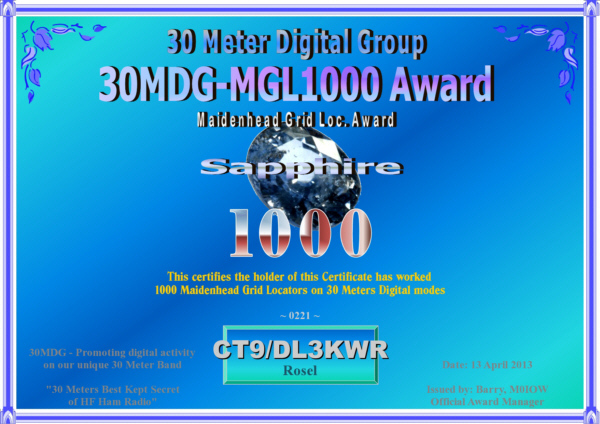 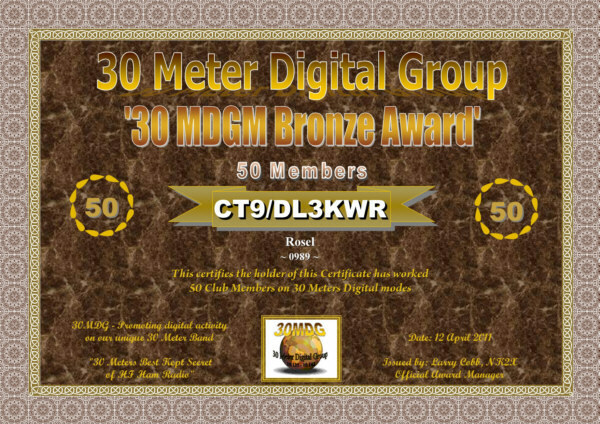 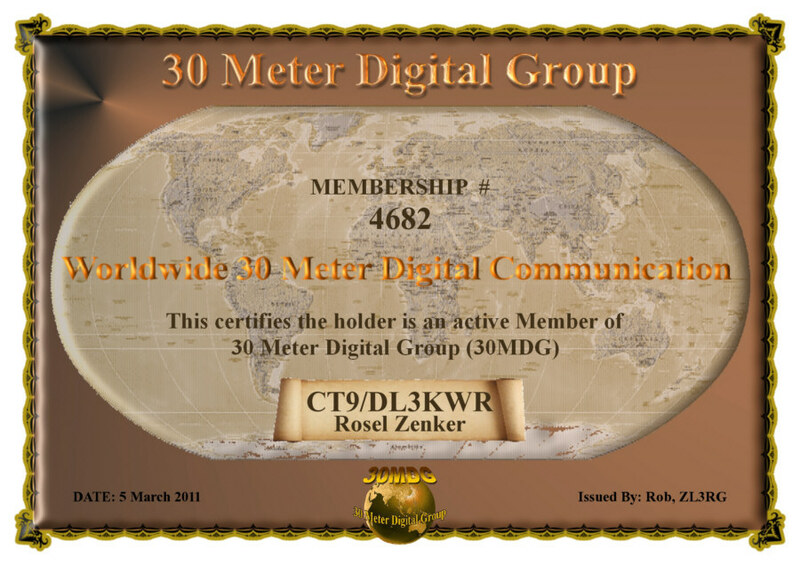 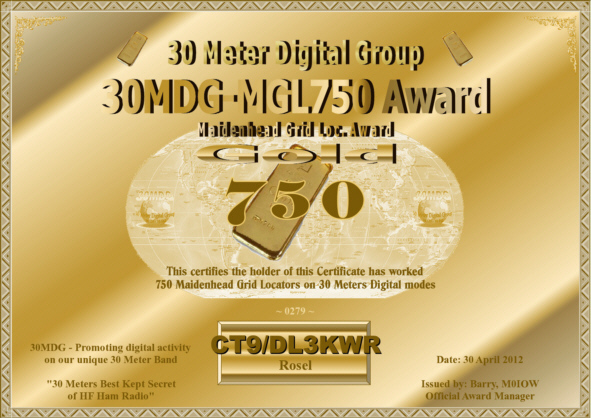 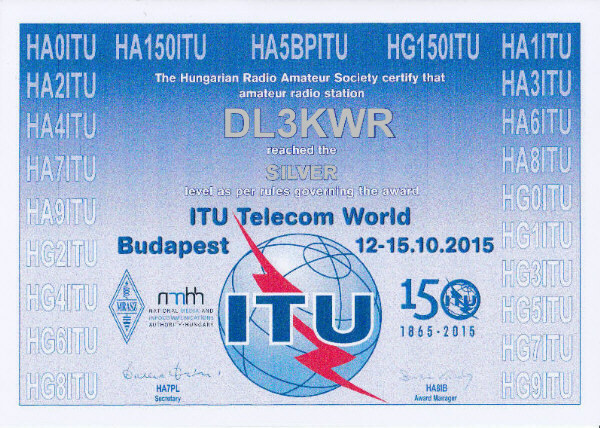 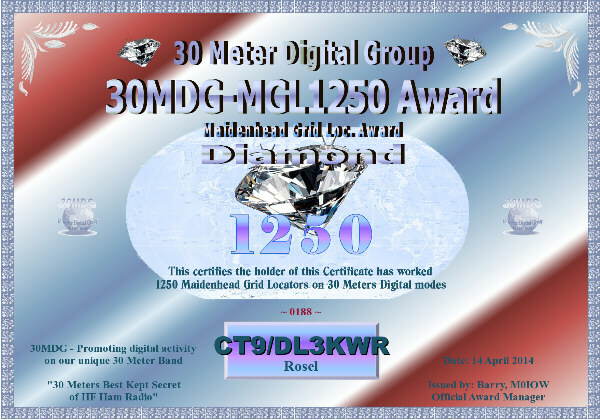 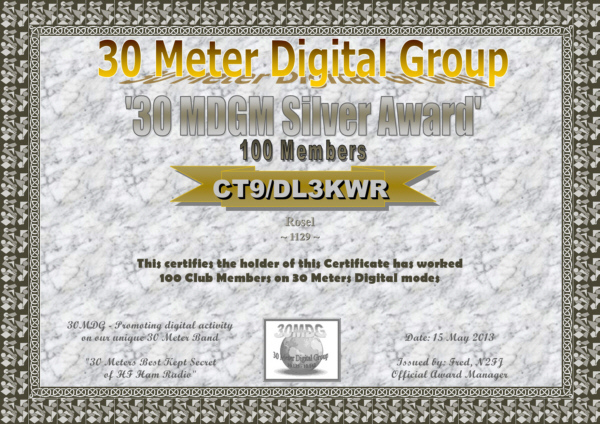 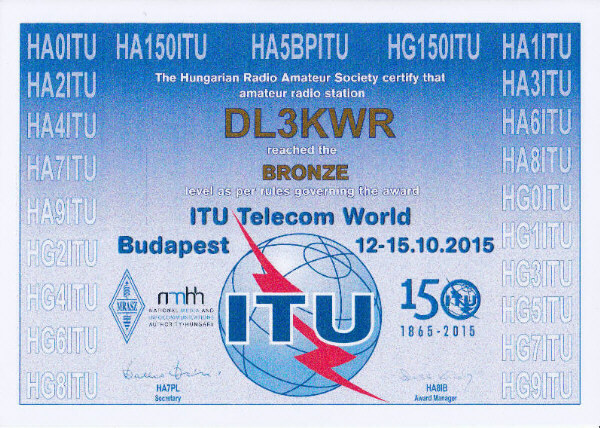 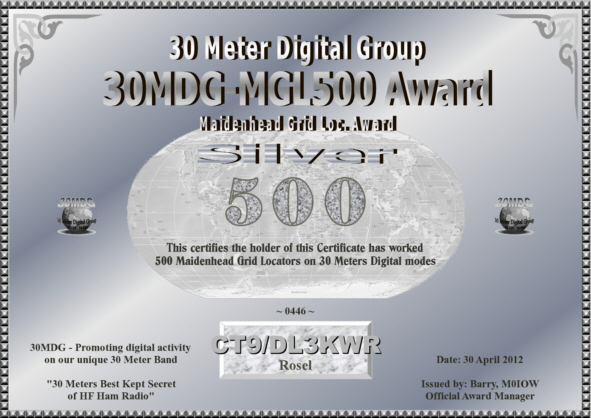 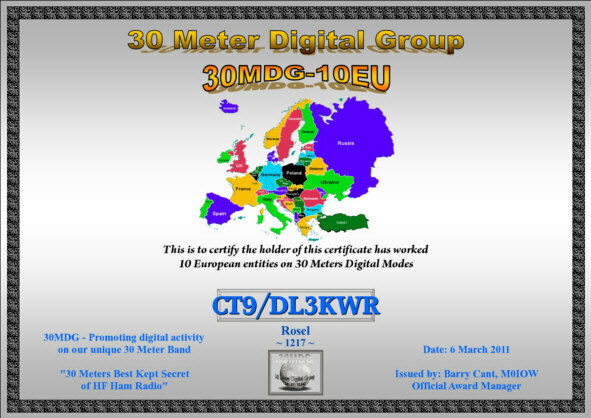 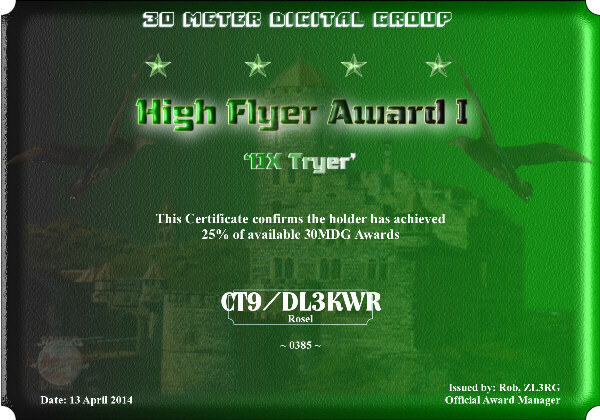 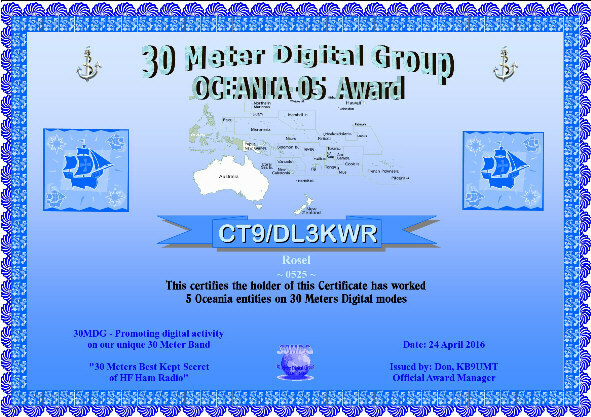 VY TNX to the 30MDG team. 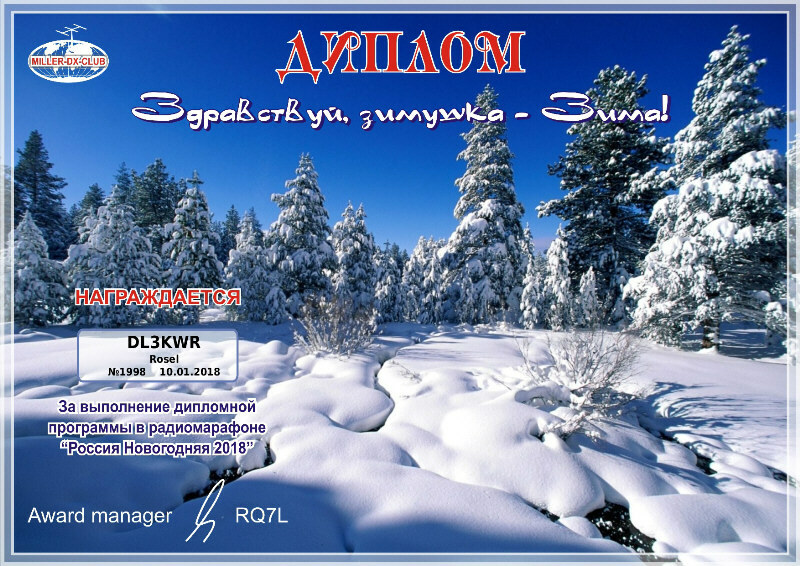 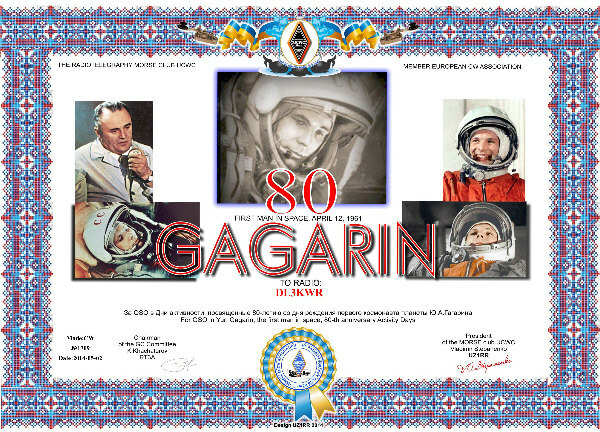 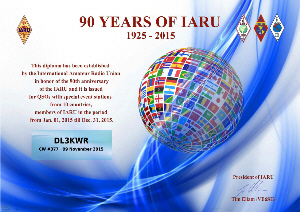 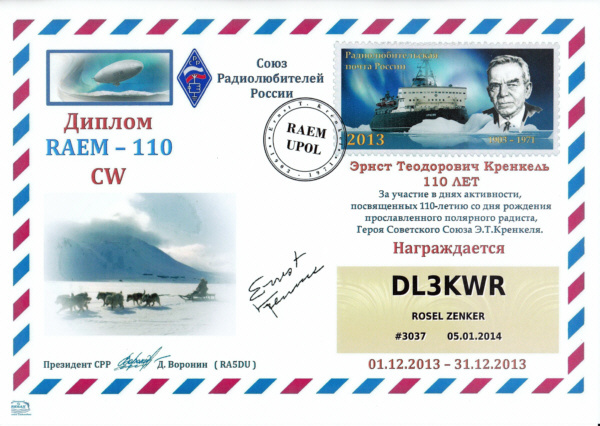 No many years' waiting for QSLs, no forms, no special "regulations", no costs; but: the log must be honest! 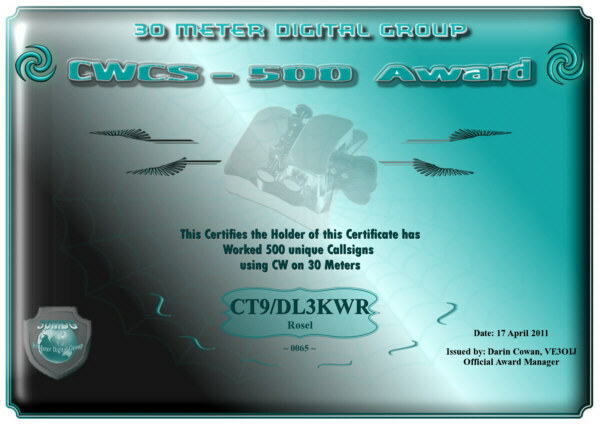 It is so simple: 30-metre log generate, with the 30MDG program call this log, certificate select from the offer, apply - download after 2 days of certificate.